This month's adventure is also my entry to the One-Page Dungeon Contest, one of the things that got this whole ball of wax rolling in the first place! 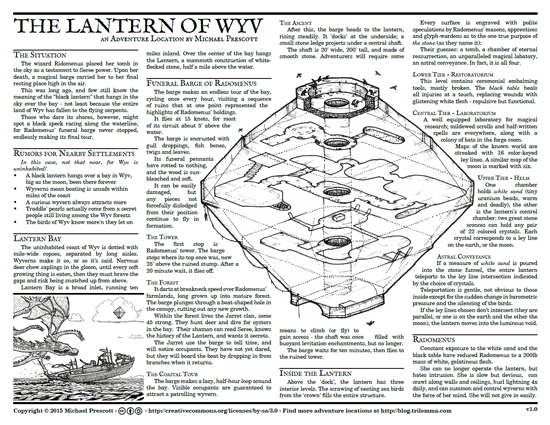 The Lantern of Wyv is actually an adventure that's been in the back of my mind for a couple of decades, back when I was coding on Angalon MUD. Text-based adventures are pretty static affairs, and I thought it would be pretty awesome to whip up something real time, a white-knuckle ride you had to be ready for. 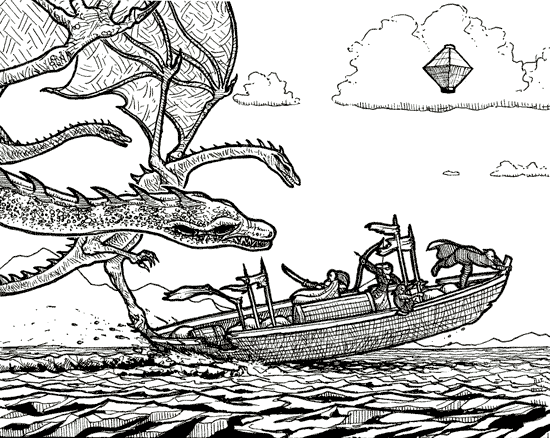 The basic idea is this: a wizard's tomb is floating in the sky, and the only way to get there is her funeral barge - it's endlessly repeating her final journey, complete with farewell tour around her watery estate. Only problem is that the area is infested with wyverns, which are suckers for brightly colored things. Like people. Assuming players can make it to the "lantern", a number of nasty surprises await. 1) This adventure requires some engineering. The middle of it is a thrill ride, but getting on board isn't easy. They'll have to construct something, bring magic, or be willing to lasso a fast-moving boat at sea in order to get on board. Once they reach the lantern, the problems are just starting: it's not designed for easy access. Players may require several trips up to the lantern to bring what they need, which might even include hirelings if the game/campaign doesn't provide parties with gravity-defying magic or similar tools. 2) There's no treasure in the lantern, the lantern is the treasure. It's a device whose usefulness plays out over a regional scale. If your players won't be delighted to have a bird-infested, radioactive flying castle, this isn't the adventure for you. This is the one-page version (one-page dungeon contest and all); a two-page version with more detail is coming soon! 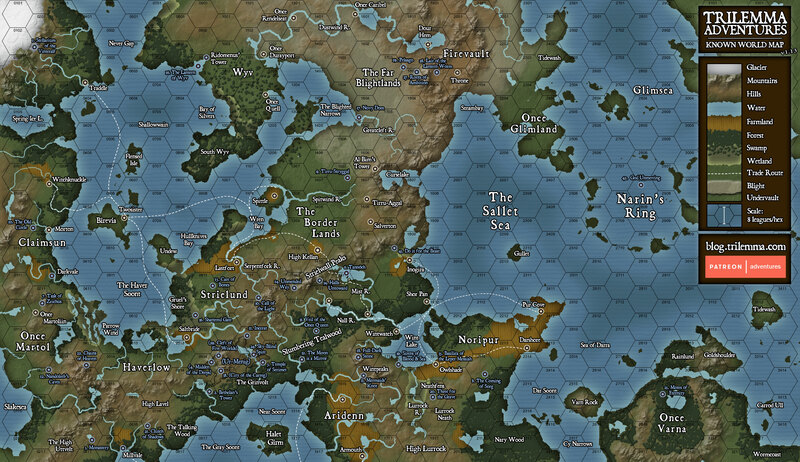 Also, the Big Freaking Map has been updated. The Lantern of Wyv is in the north west!